For the following project, our design team was asked by the Center for Disease Control and Prevention (CDC) Division of Bacterial Diseases (DBD) to improve the design of a manual centrifuge in international health laboratories. The CDC DBD labs perform a multitude of routine tests and health surveys in an effort to track the spread and prevention of various illnesses like meningitis and Aids. To do this, technicians analyze bodily fluids like blood with the use of centrifuges. Ideally, technicians have state of the art electric centrifuges to safely handle samples. In reality, frequent power outages and broken equipment make using electrical centrifuges difficult. Many lab workers compensate by resorting to unsafe lab techniques which pose risks to the workers and results. The DBD has begun experimenting with centrifuge proxies using common household salad spinner. 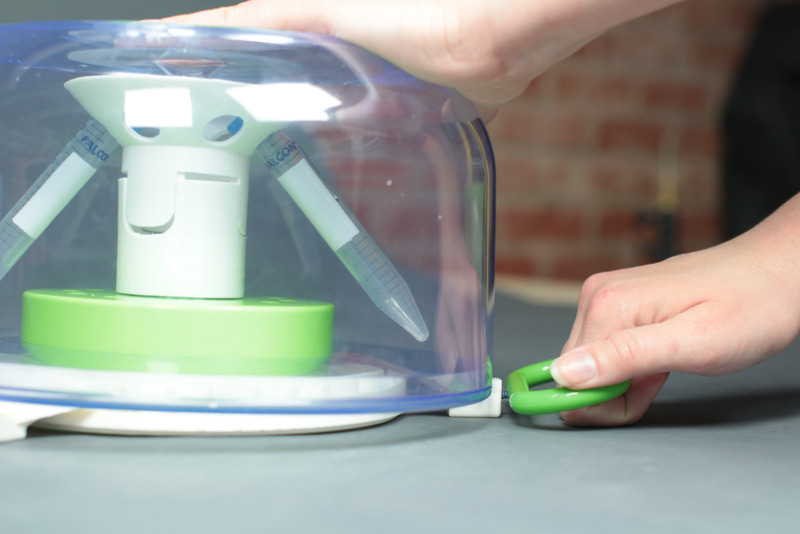 For this project, our team sat down with the BDB to see how we could innovate on the salad spinner concept to increase safety and ease of use. Research included an interdisciplinary stakeholder analysis with individuals form public health and NGO backgrounds to gain a more nuanced view of heath in the context of development. Following a stakeholder analysis, we looked a products that could spin with hand power like toys, laundry hand dryers, manual lab equipment and different models of salad spinners. We did an in-depth analysis of the mechanisms that made these devices spin, the hand motions required and the force involved. 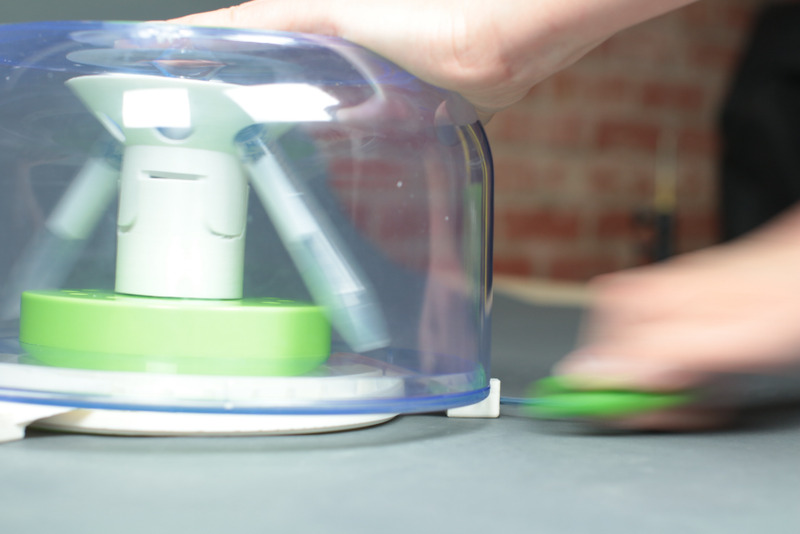 In the concepting phase, we examined how 3D printing could be incorporated with the existing salad spinner. Early on, we realized that 3D printing could be used to create a modular system allowing for even greater versatility in form and function. Its flexibility also satisfied design criteria such as durability and transport needs. 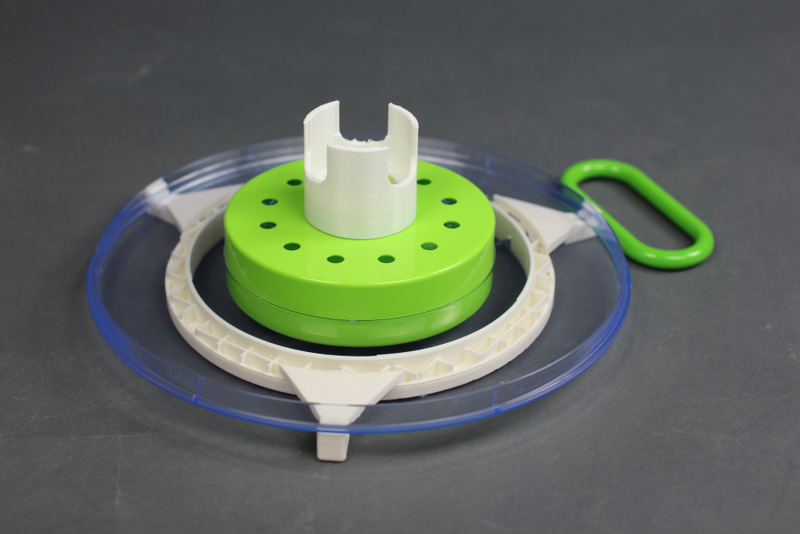 For our final design, we proposed a 3D printed base that was attached to the lid of the salad spinner, allows for 3 different tube sizes to be placed in the centrifuge (1.5ml, 15ml, 50ml). It's modular design allows parts to be interchanged as needed. 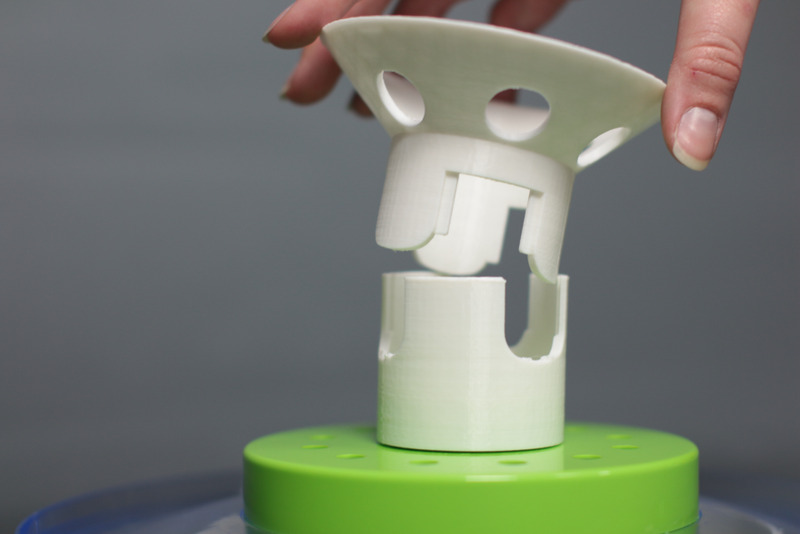 Since a CAD model was created for each components, parts can be easily reprinted if broken and even sent digitally to international maker spaces. Finally, the entire system can be put into a cary-on suitcase allowing CDC employees to transport internationally. 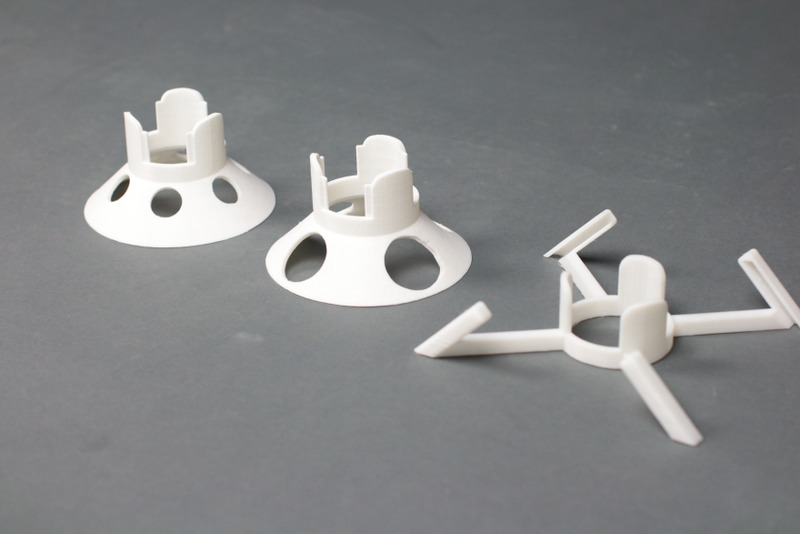 By utilizing 3d printing technology, parts can be easily reproduced, shipped and delivered. Additionally, its modularity provides little barrier to entry regardless of the technicians level of expertise. Finally, by being parametrically designed, future unites can be scaled to meet a range of salad spinner models. The CDC DBD labs perform a multitude of routine tests and health surveys in an effort to track the spread and prevention of various chronic and life threatening illnesses like meningitis and AIDS. To do this, technicians must often analyze bodily fluids like blood and plasma with the use of centrifuges. In an ideal environment, technicians have state of the art electric centrifuges to safely handle samples. In reality, frequent power outages and broken equipment make using electrical centrifuges consistently difficult. To compensate, many lab workers resort to unsafe lab techniques posing health risks to the workers and unreliable test results. The DBD has begun experimenting with centrifuge proxies using common household salad spinners. 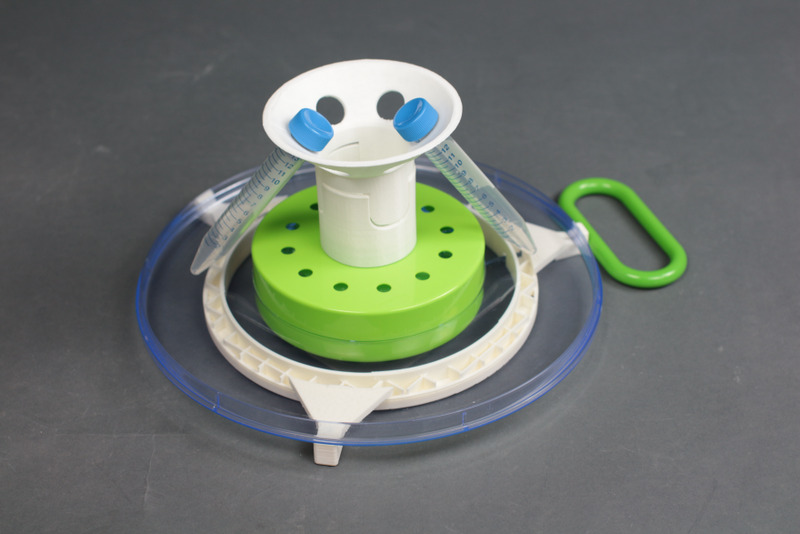 The salad spinners contain the same centripetal force needed for the biosamples, and their price and size make them easy to transport abroad. 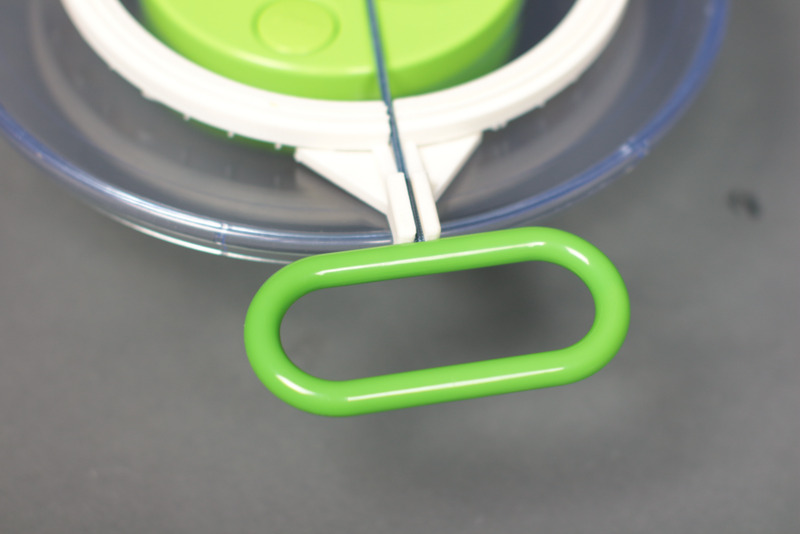 The salad spinners meet many of the immediate needs, but their physical size and open design still leave room for improvement. For this project, our team sat down with the BDB to learn more about their needs and specific requirements. In addition, we performed an interdisciplinary stakeholder analysis by speaking with individuals from various public health and NGO backgrounds to gain a more nuanced view of heath in the context of development. From our research, we identified 3 levels of stakeholders. The primary stakeholder is the lab technician. This individual is a local worker which generally has a baseline technical training. The device needs to have a low barrier to entry and a high threshold for failure. In addition, the environmental conditions of the lab indicate that the device must be durable and easy to replace. The secondary stakeholders included the BDB employees and other NGOs workers who were on the ground. These individuals told us about the technical requirements needed for the devices. These included factors such as the tubes needing to be spun at a 45degree angle, and the need for the centrifuge to fit multiple sizes of tubes including 1.5ml trays, 15ml tubes and 50ml tubes. The BDB staff also informed us that the final design would need to be easily transported in personal luggage and carry-on suitcases. Tertiary stakeholders included those offering social or political support for the labs as well as BDB partners. From these stakeholders, we learned that the final design should be made in a way that would be economically and socially sustainable, as well as help enhance the overall partnerships between the CDC and its stakeholders. Following a stakeholder analysis, we looked a similar products to benchmark our concept. We looked a products that could spin with hand power. These included spinning toys, laundry hand dryers, other manual lab equipment and approximately a dozen different models of salad spinners. We did an in-depth analysis of the mechanisms that made these devices spin, the hand motions required and the force involved. Models were ranked agains factors like usability, efficient, compatibility, durability, size and price. This allowed our team to find the mechanism that could be the most easy to access, with the least amount of effort. After our product comparisons, we began the concepting phase and arrived at 3 general concepts. 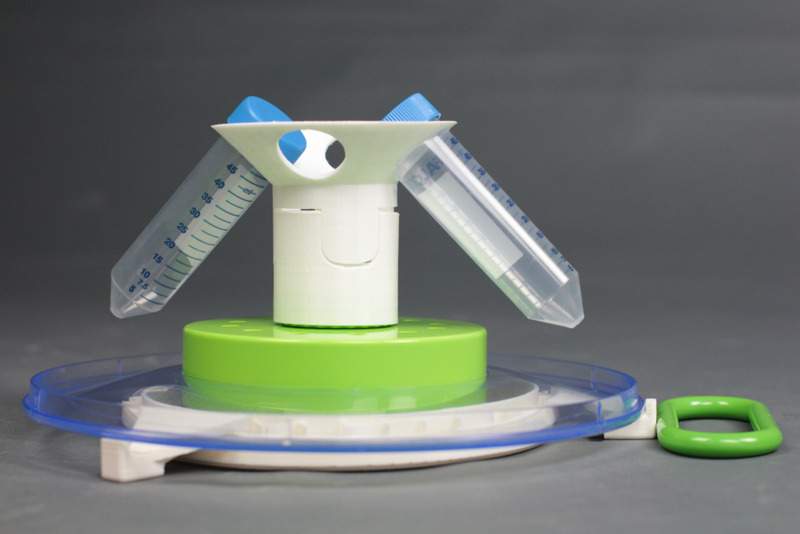 The first used a 3D printed central insert with interchangeable parts for different kinds of tubes and wells. It also flipped over the orientation of the spinner to allow for more room. The second concept was am open air design that utilized the cap of the salad spinner with a newly designed 3D printed base. The third concept was a central mesh insert that used a flexible material to hold in tubes of different sizes with tension. Based on the evaluation of our three designs against the criteria we established a set of key findings to work towards in the final solution. One thing we noted was the freedom allowed by flipping the salad spinner upside down. This created more space and therefore more tube configurations. We also came to learn the advantages of 3D printing. We realized that 3D printing could be used to create a modular system allowing for even greater versatility in form and function. Finally, we also used the 3 concept development to further examine how the design could be more easily transported. For our final design, we utilized the best of each concept, and emphasized the use of 3D printing technology to provide a sustainable and novel solution. 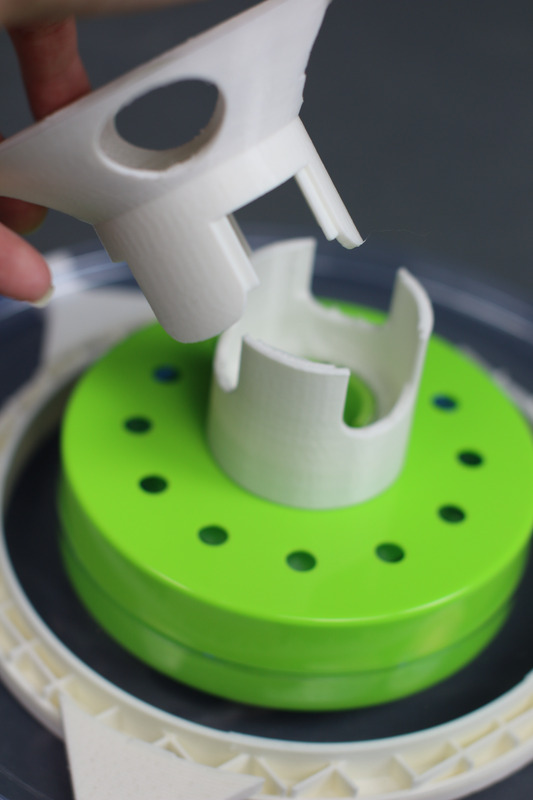 A 3D printed base, attached to the hood of the salad spinner, allows for 3 different tube sizes to be placed in the centrifuge (1.5ml, 15ml, 50ml). It's modular design allows parts to be interchanged as needed. Since a CAD model was created for each components, parts can be easily reprinted if broken and even sent digitally to international maker spaces. Finally, the entire system can be put into a cary-on suitcase allowing CDC employees to transport internationally. By utilizing 3d printing technology, parts can be easily reproduced, shipped and delivered. Additionally, its modularity provides little barrier to entry regardless of the technicians level of expertise. Finally, by being parametrically designed, future units can be scaled to meet a range of salad spinner models. Looking ahead, our team also proposed the concept of using onsite maker spaces to 3D print parts locally. Efforts from intentional universities have seen a rise in maker spaces and innovation communities in the Global South. By giving these spaces a product to print, it could be an opportunity to the CDC to forge partnerships and extend their impact in the communities that are hoping to serve.